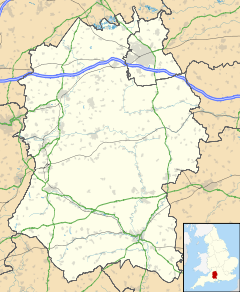 Rowde (/raʊd/) is a village and civil parish in the English county of Wiltshire, on the A342 about 1.7 miles (2.7 km) northwest of Devizes. The village now mainly consists of modern brick built houses, but a number of 17th-century buildings still remain in the centre of the village, including the George & Dragon public house. This was pre-dated in the village by another pub, a timber framed and thatched building that was destroyed by fire in 1938; a replacement, the Cross Keys now stands in its place. On the outskirts of Rowde are the Caen Hill flight of locks of the Kennet and Avon Canal. The canal rises 237 feet by means of 29 locks, 16 of them in a straight line at Caen Hill . The canal was constructed between 1794 and 1810 and served to link Devizes with Bristol and London. It fell into disuse after the coming of the railway but has been restored, and is now used for leisure purposes. The small hamlet of Rowde Hill, consisting of around 10 residences, lies around 1.3 miles (2.1 km) west of the village towards Sells Green and Melksham, at the junction of The Common and Berhills Lane (though this is not signposted). The parish has a village hall, built in 1887 as Rowde Reading Room and Coffee Tavern. Rowde C of E Primary Academy serves Rowde and nearby villages. Built in 2006, it replaced a school in Marsh Lane which was built in 1841 and extended in 1907. Rowdeford School, to the north of the village, is a Special Needs school. The Anglican church is dedicated to St. Matthew and has a 15th-century tower. It has a font designed in 1850 by Sir Matthew Digby Wyatt, architect, who was born in Rowde and lived for a time at Rowdeford House (now the home of Rowdeford School). Rowde is a civil parish with an elected parish council. It is in the area of the Wiltshire Council unitary authority, which is responsible for all significant local government functions. In the 2001 census, the district ward of Bromham & Rowde had a population of 2,880 persons. The Devizes Branch Line was built through the parish in 1857 and a station (Bromham and Rowde Halt) was added in 1909 at Sells Green, to the west just outside the parish. The line was closed in 1966. ^ "Wiltshire Community History - Census". Wiltshire Council. Retrieved 6 April 2015. ^ "Victoria County History - Wiltshire - Vol 7 pp217-223 - Parishes: Rowde". British History Online. University of London. Retrieved 13 November 2015. ^ "Rowde C of E Primary Academy". Retrieved 6 April 2015. ^ "Rowde Church of England V.A. Primary School". Wiltshire Community History. Wiltshire Council. Retrieved 13 November 2015. ^ "Church of St. Matthew, Rowde". Wiltshire Community History. Wiltshire Council. Retrieved 6 April 2015. This page was last edited on 19 December 2018, at 17:56 (UTC).